Bullying can be defined as unsolicited, aggressive behavior involving an imbalance of power. It can be physical (punching, kicking, etc. ), and can also take the form of insults and taunting. Prolific use of the Internet has led to the problem of cyberbullying, in which social networks are platforms for humiliation and ridicule. Cyberbullying is particularly worrisome because of the rate at which information travels and how quickly an embarrassing photo or video can be shared with tons of people. Bullying does not only affect children with ADHD. UNICEF has stated that the problem affects over one in three children between the ages of 13 and 15. Statistics show that the vast majority of physical bullying takes place in schools, with a small percentage taking place in public spaces, like the park. Bullying tends to begin in primary school, reach its peak in middle school, and lessen in high school. Certain groups are at a particularly high risk of being bullied; this includes LGBTQIA (Lesbian, Gay, Bisexual, Transgender, Queer, Intersex, Asexual) community, as well as children with disabilities (ADHD is included in The Americans with Disabilities Act as a disability) or learning disabilities. A select body of literature shows that children facing issues and conditions like diabetes, autism, epilepsy, ADHD, and stuttering, are more likely than other children to be bullied. If you suspect that your ADHD child is being bullied, or taking part in bullying behavior, it’s vital that you take the appropriate measures. This is because the effects of bullying extend far beyond the actual incident; bullying has been proven to have long-term mental and physical effects on its recipients. One recent study showed that victims of bullying tend to have higher levels of C-Reactive protein (a biomarker of chronic inflammation) in their adulthood, and they have a greater likelihood of suffering from depression, digestive upsets, and anxiety. Bullying is also linked to a higher suicide rate. Children with ADHD can find it challenging to form close friendships at school. Some may seem impatient to others, others may display ‘bossy’ behavior, and still others may miss vital social cues or seem inattentive during playtime. Bullying can emanate from the smallest thing such as merely having a reputation for lacking patience. One recent study comparing teen girls with and without ADHD found that those with the disorder were more likely to be victims of physical, verbal, and social bullying; they were also more likely to indulge in bullying behavior. If you feel your child may be a bully, it’s imperative that you speak to your child’s teacher to see how the school is dealing with the issue and what measures are being taken to stop it. Try to foster an open, honest, and non-defensive relationship with your child’s teacher so that they feel comfortable telling you about any bullying behavior your child has displayed or if your child has been on the receiving end of bullying. The problem will worsen if your child’s teacher is fearful of talking to you about instances of bullying. Since the ultimate aim is to help your child, it helps to be on the same team. Another way to help your child is by trying to help them make friends; children who are part of a tight social circle are less likely to be bullied since they seem less vulnerable and isolated. If you find that your child gets on well with the other child, try to foster the friendship by inviting the child to your home and keeping the children entertained with a short, focused activity. 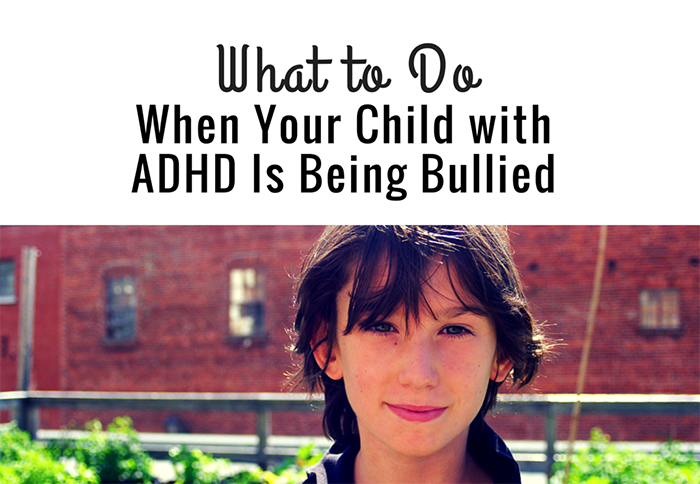 (Kids with ADHD can become frustrated or bored during activities which go on for too long.) When you’re home alone with your child, play lots of games with them so that they become accustomed to some of the most difficult parts of social interaction – such as turn-taking, patience while someone else is playing their part in the game, and learning how to lose. Even if bullying is happening, it’s vital that your child not see that you get too tense about it since research has shown that ‘helicopter parenting’ can exacerbate symptoms of ADHD. Let your child know you care, that you are always there to listen to them, and that you can help them solve the problems they face. Nobullying.com, Bullying Statistics 2014, accessed April, 2015. Forbes.com, The Psychological Effects of Bullying Last Well Into Adulthood, April, 2015. NationalGeographic.com, Bullying’s Long-Term Effects Seen in Both the Bullied and the Bully, accessed April, 2015. Osteopathic.org, Cyber Bullying and its Effect on Our Youth, accessed April, 2015. Education.com, ADHD and Bullying: How to Help, accessed April, 2015. Bullyingstatistics.org, Bullying and suicide, accessed April, 2015.